Joe Andoe at Almine Rech. Installation view courtesy of Almine Rech. 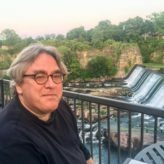 The excellent figurative painter, Joe Andoe, specializing in horses and landscapes, hails from Tulsa, Oklahoma, but he has lived in New York since 1982 (works in a studio in the Brooklyn Navy Yard). His brand of high poetic realism can be linked to the photorealism that was popular in the Eighties, but the paintings he makes are not so much compelling for their technical particulars–although they are certainly excellent in this way–as they are moving by virtue of their lyric, even visionary, treatment of animals and rural scenes. 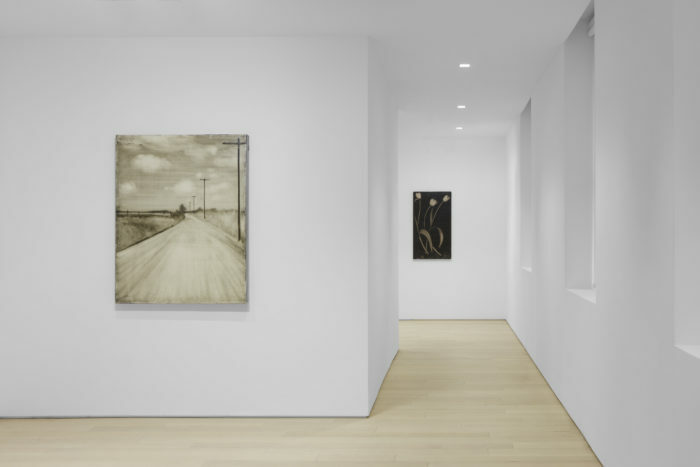 It is interesting to note that his bias toward a rural imagery does not match his current circumstances, which are as gritty as a place can be in New York City. 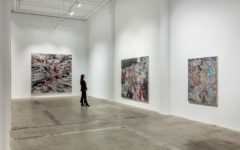 So, in a major way, he is working from memory, although the immediacy of the paintings argues for continuing, intense experience outside urban areas. Andoe was quite well known in the Eighties, showing with Blum/Helman Gallery on West 57th Street, but then, people lost track of him. 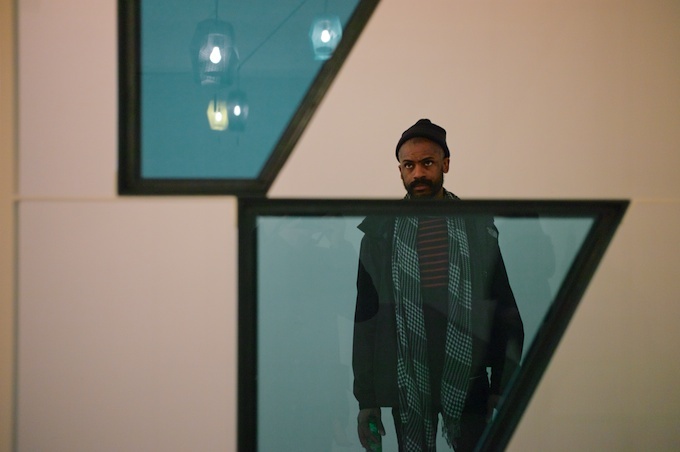 This current show re-establishes, in this moment, an artist whose voice remains vibrant and alive within a style that is not so much conventionally traditional as it is deeply felt and compositionally strong. Joe Andoe at Almine Rech. Installation view courtesy of Almine Rech. 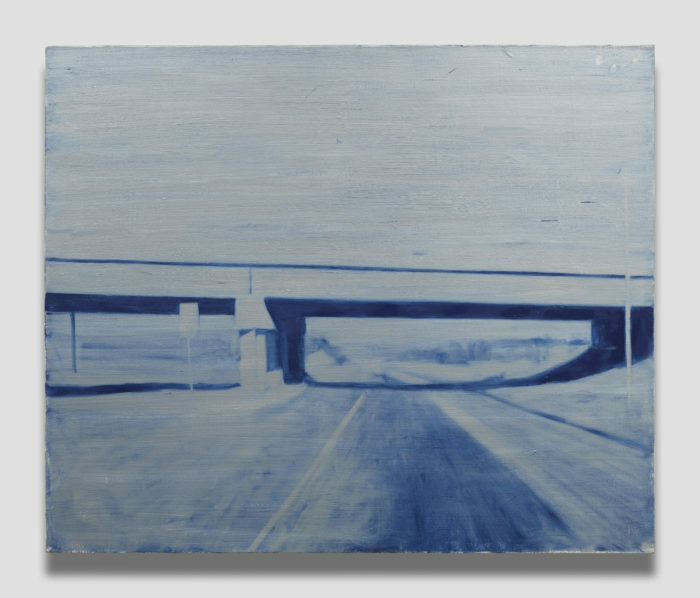 (L) Jon Andoe, Untilted (Road), 1998, oil on linen, 46 x 36 in. 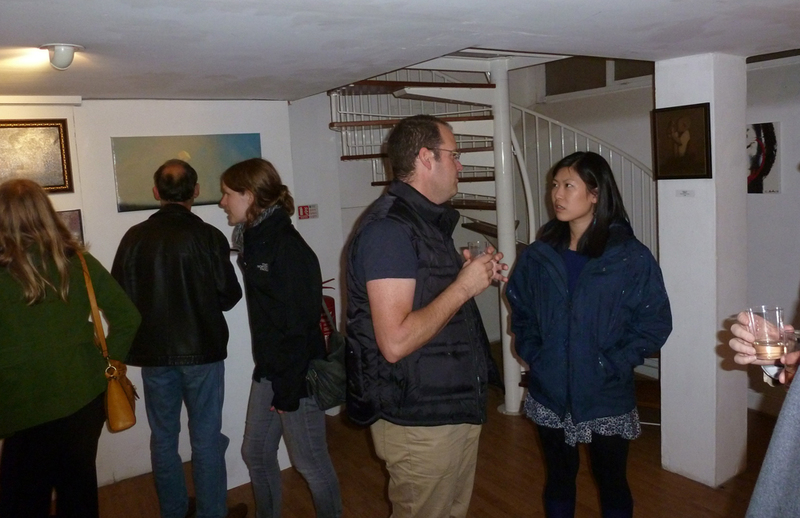 Many of the paintings go back twenty years. Untitled (Road) (1998) is a wonderful oil-on-linen work. It is done in a light-tan color; a broad dirt road takes up most of the center of the painting, with a string of three telephone poles on the right and a piece of a field on the left, with some trees in the distance. Cumulus clouds dot the sky. The composition holds together beautifully; while the scene is commonplace, Andoe invests it with an atmosphere magical in its feeling and sympathy for nature. This happens regularly in his paintings. Road shows us that it is still possible for a painter to see the landscape with genuine affection, free both of sentiment or nostalgia. East Central (2004) is a highway scene, with a bridge moving horizontally across the composition. Under the bridge is a highway that seems to stretch forever into the distance, with the sky taking on a prominent place in the overall structure of the image. The entire view is painted a light, nearly luminous blue, giving the painting the kind of lyric pleasure Andoe creates so often and so well in his art. But this is a picture of a man-made construction, more so than the road flanked by fields and topped by sky in the work discussed above. Joe Andoe, East Central, 2004, oil on linen, 50 x 60 in. Jon Andoe, Rough and Ready, 2005, oil on linen, 50 x 60 in. 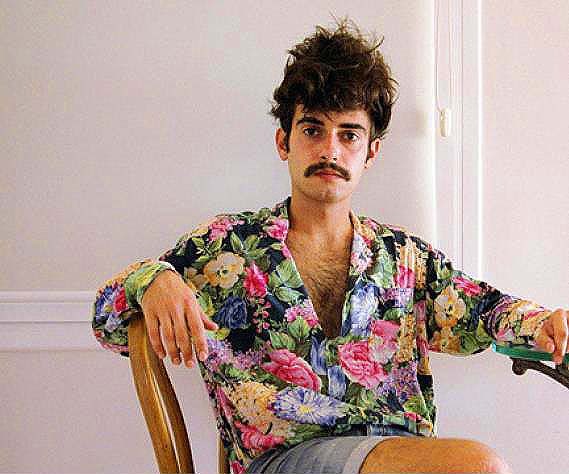 It is pretty clear that Andoe is directed toward the pleasures of art–not toward politics or edification. It used to be that art of this kind was accepted as a poetic statement of the reality around us; and one can only hope that Andoe’s unusual hand will continue to be understood as pursuing a figurative appreciation of the understanding of things that contribute to our scenario, here a mostly rural one. His horse paintings, available in this show, accommodate what can only be called tenderness for the creatures. This emotion is not found on a regular basis in contemporary art! 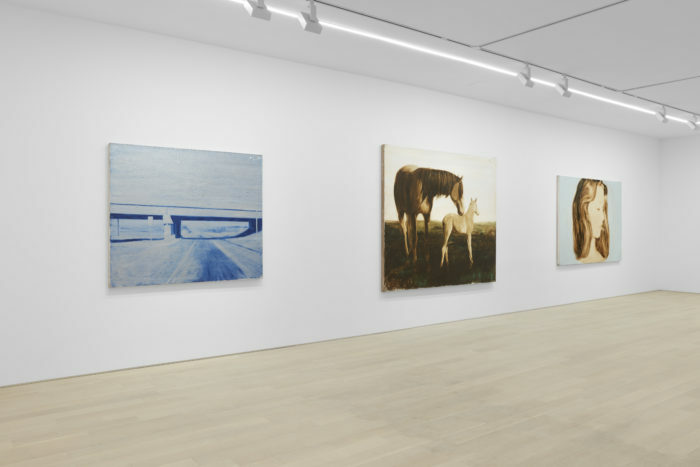 Its lack in current painting makes it all the more necessary to acknowledge the sympathy that Andoe brings to his horse paintings, which somehow escape the trap of emotionalism or an excessive softheartedness. Animals occasion such feelings, which are certainly appropriate as feelings–but art cannot give way to a cloying disposition, which would turn the image mawkish and unacceptably immoderate in its dependence on poignant effects. Andoe never commits his sensibility to such a presentation. 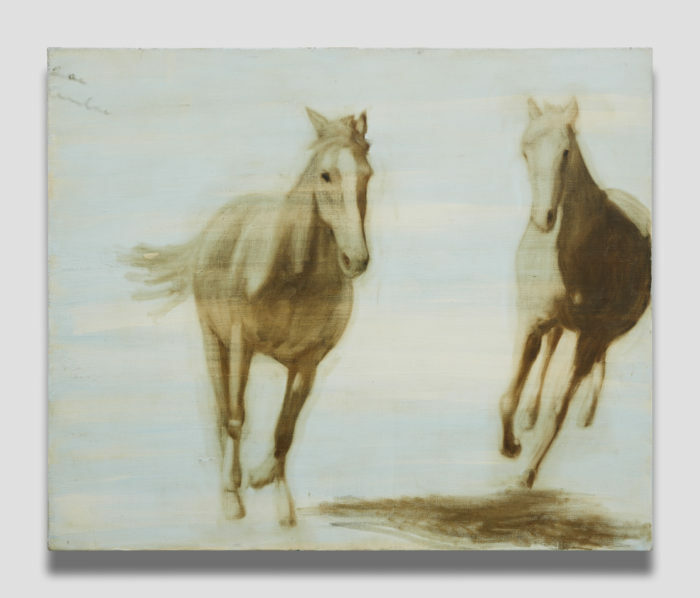 Rough and Ready (2005) shows two pale-brown horses galloping toward us; the one on the left possesses large, liquid eyes, which promote a reading of vulnerability in the animal. But that just may be our interpretation; feelings are often inaccurate, if genuinely felt, in art, although it is clear Andoe means to evoke sympathy in the picture. Jon Andoe, Menthol, 2010, oil on linen, 57 3/4 x 82 in. 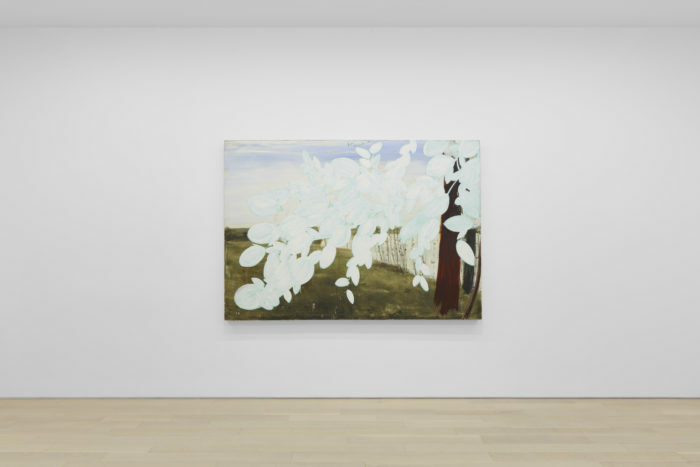 Another lyric painting is Menthol (2010), a study of oval, white cascading blossoms that fill the greater part of the painting. A tree trunk stands on the right, while the bottom left and middle of the composition are taken up by dark green grass. A thin horizontal portion of blue sky with cirrus clouds takes up the top of the picture, while beyond the brown tree trunk, further on the right, we see a bit of gray river. Who would have thought that such an image could believably sustain its own delicate propositions? But, as usual, Andoe makes nature seem timeless, as present now to our own understanding of the landscape and flowers as earlier painters were to the same subject matter. There are two smaller paintings of tulips in the show. One, painted in 1995, shows three flowers with bell-like heads rising upward on thin steps against a very dark background. It is just a flower study, but Andoe invests the painting with his usual lyricism, giving the composition a grace and fidelity to nature. The latter is, more than likely, the origin and support for that grace. Art like this documents the truly non-human aspect of natural design, offering an alternative to the beautiful, but to a degree brutalized, painting of the cement bridge over the highway. Thus, Andoe concentrates on the exterior environment, witnessing nature’s resolve not to embellish or decorate, but to produce forms whose beauty is usually a consequence of function. It is strange to read nature’s attraction as a consequence of the need to survive, but this is true. In the long run, Andoe’s art will convey a highly accomplished ability, as well as a deep-seated affection for works and living creatures outside a purely human purview. His sympathy, even for a dusty road, is remarkable. He asserts painting’s vision of a world that is slowly and surely changing, its landscape being in grave danger of permanent loss. There may be very little we can do about this, but we can accept more than small solace from art, which records nature in a way that both documents it as it is and interprets it as we might view it as something large–from within. 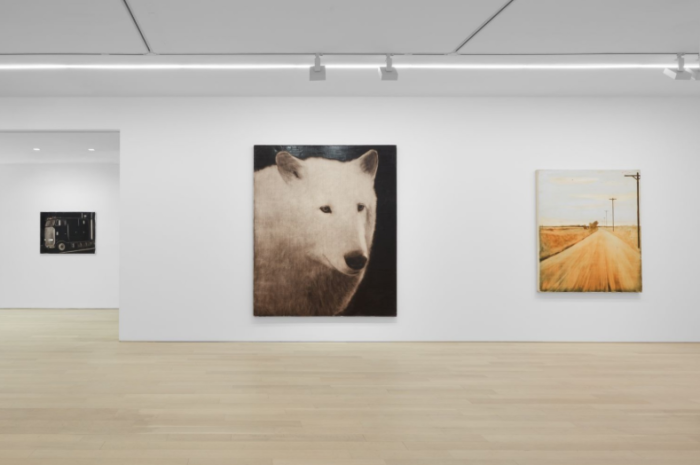 And Andoe’s animals–there is a wonderful painting of a large, white wolf from 1997–are invested with a human presence, due to the artist’s willingness to inhabit their inner life. Sadly, we can no longer see the landscape the way Andoe did only twenty years ago when he made these paintings. Today, we talk about “managing” forests without irony. And despite Andoe’s gifted intuitions, it is not possible to read an animal’s feelings with particular accuracy. 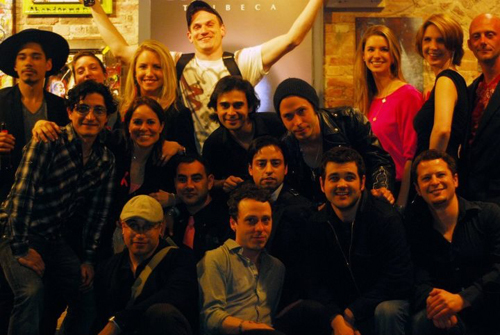 Instead, with Andoe’s art leading the way, we can present the world as it might occur in the best of our imagination.